With changing times, Hologram labels and stickers have also become the preferred choice of many manufacturing companies that are engaged in manufacturing of products for regional and international markets. As Hologram labels are easy to apply on product, these stickers are difficult option for counterfeiters to duplicate or black market the product. Further, as process of manufacturing hologram stickers is unique, it becomes equally difficult for the stickers to reproduce. These Hologram Stickers are meant to make the products more attractive with its 3-D photographic appearance that made these stickers more vibrant colorful and shiny. These are highly suitable for labeling high quality products. Packaging Details : As per international quality standards. The customer has the choice to select the kind of security required. Ideally, hologram stickers are manufactured as light is reflected from any object and is later re-enacted in manner where subject seems to appear in different positions to hologram viewer. We can offer these Hologram stickers in form of long sheets with silicon release papers that not only meets criteria of companies but also helps them in securing product identities. 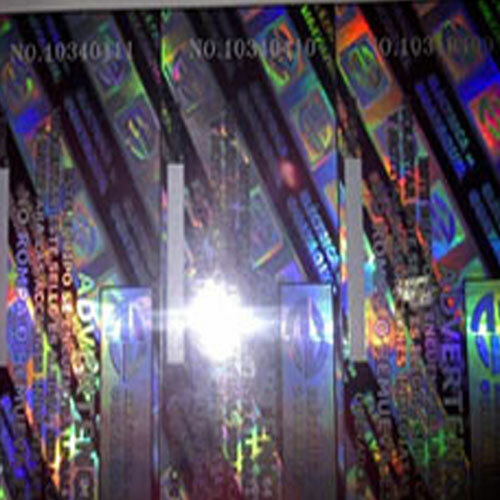 With coming of "Rainbow Transmission" technique, holograms sticker manufacturers are using ordinary light for 3 day replication in hologram. The technique used is unique. Here, surface print is used on plastic film that is followed by aluminium mirror coating. This generates 3-Dimensional effect that makes these perfect to be used for credit cards and security tags. However, these hologram stickers are a costly option for product manufacturing companies. The 3D/2D hologram sticker option offered by us is designed keeping in view two dimensional layers with images through visual intact. Further, these 3-dimensional images are also easily replicated, thus making hologram stickers and label manufacturing process both easy as well as symmetrical in nature. We focus involved production process as per the specific needs of the customers. Here, our expertise lies in bringing necessary modification in production plans so as to match up with the stickers and labels to meet counterfeit problems that clients encounter when they introduce product line in open market. Please ask for free Hologram label quote as well as samples that will save money as well as add uniqueness to products like never before. With the delivered labels highly recommended for their unmatched quality, we also ensure that these special self adhesive labels come recorded on special film laminate as per the specified art work needs of the customer. With offered range of hologram labels used in different industries for meeting the security and branding demands, our team ensures the products are widely preferred to provide desired security and authentication to the products. Further, these hologram stickers are also virtually impossible to duplicate/replicate when used in areas like security purposes, brand, brand authentication and promotion.